Right in the beginning of the first set Frank broke Aisam’s serve and continued to maintain his upper hand till he took the set. Aisam did not feel dejected at all and increased his intensity in the second set. He got two break points on Frank’s first service game but did not succeed to convert the same. Eventually the set went into tie break as both were tied at 6-6. In the tie break again it was real tooth and nail competition and at 8-8 Frank was able to break Aisam’s serve to take a 9-8 lead which provided him a set point. But Aisam struck back like lightening and snatched next two points from Frank to take a 10-9 lead. Then he made no mistake to take the tie break with an 11-9 score. Having equalled the match with a one set all, Aisam really got pumped up and broke Frank’s serve twice to take a 4-0 lead and went on to win the third set. By now two hours had passed and the players were entering into a zone where the fitness and stamina is tested to the limit. In the fourth set the fit like fiddle Frank thought to have an edge over the Asian boy but that was not to happen. 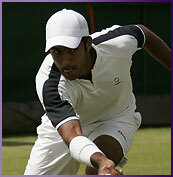 Aisam was still in his full form and fit to compete with him at the highest level. By and by the set went on to 6-6, as neither of them was ready to give in. But in the tie break Aisam was too good and unstoppable as he went on to take 4-0 lead and eventually took the set with a score of 7-6 in the tie break. “I am very happy that I have done it. It is all due to the prayers of my parents, my family and all the tennis loving people of Pakistan”,said Aisam after the match. “I request all Pakistanis to keep praying that I may continue to earn laurels for Pakistan”,he added. In the good old days the players were entered in the Wimbledon by invitation or country nomination.Aisam has previously played in the doubles event of the Wimbledon twice. Aisam is also perhaps the only player to participate in both the singles and doubles events of the Wimbledon which is a great moment for Pakistan tennis. Know this, Mr Qureshi, the nation is behind you, fully supporting you, cheering you on and praying for your success! Having lettered in a competitive sport in high school, I can tell you that Mr Qureshi's victory is particularly impressive: at the level he's reached, until age becomes an issue (at 27 not for him for quite a while) overall it's more mental than anything else, and coming back after getting thrashed in the first set says a lot. I tried my hand at Tennis once at a sports event of my university. I was accustomed to badminton but still, tennis wasn't an easy game to play. Therefore, I appreciate the effort put forth by Aisam Ul Haq Qureshi. He may win or lose, but regardless of that what matters to me is that he made the effort to succeed and he has actually achieved something. And he won his match today. Cheers!